The idea of using nuclear fission to propel a ship through space dates to the Cold War, when both the United States and the Soviet Union conducted studies related to nuclear propulsion. At the time, none of these rockets ever entered space due to budget shortcomings, interests shifting away from reaching Mars, and the completion of the Apollo program. Recently, a revived interest in Mars exploration and long-distance space travel has driven NASA’s Marshal Space Flight Center in Huntsville, Alabama, to enter a three-year, $18.8 million contract with BWX Technologies Inc., with the goal of advancing current concepts of nuclear thermal propulsion. Photo: Artist’s render of theoretical interplanetary spacecraft powered by nuclear propulsion. In a nuclear-powered rocket, fission produces an immense amount of heat that ionizes liquid hydrogen within the reactor, turning it to plasma. This plasma is guided out through a nozzle on the back end of the ship to produce thrust and propel the ship through space. The thrust produced from this reaction is more efficient than the thrust produced from typical chemical propellants, and it requires less fuel, thus lowering the weight of the craft. 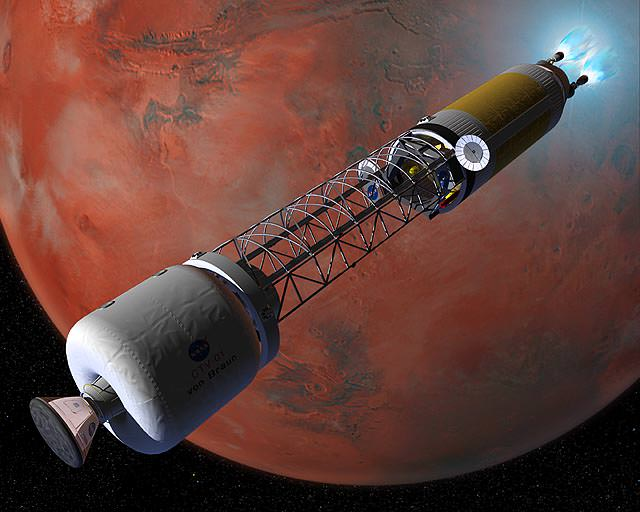 NASA has estimated that the nuclear thermal propulsion system can even cut the voyage time to Mars down to four months, compared to the typical six-month travel time. BWXT, as mentioned above, is currently designing a reactor that uses low-enriched uranium as fuel as well as a ceramic metallic alloy (composed mainly of tungsten) to be used in the fuel elements. This alloy is extremely heat resistant, but it is very difficult to make since the metal components must be nearly 90 percent pure. After their three-year contract is completed in September 2019, NASA’s Nuclear Thermal Propulsion team will determine whether the use of low-enriched uranium is feasible and cost effective. If the test results support the use of this fuel, NASA will spend a year testing the integrity and efficiency of the fuel elements. This evaluation will determine if these rockets will be used in possible voyages to Mars. These advancements in nuclear thermal propulsion could be the key to making Mars the next destination for astronauts and humankind.